Of course the joke’s on me. The revelation- spoken by hard-as-nails Sheriff Nick Braden doesn’t come until page 285- but I knew the book was gonna be a stinker by page 10…yet I still kept reading. 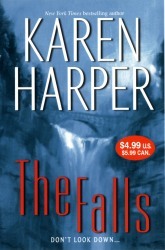 Publishers Weekly loved The Falls and said Harper has a fantastic flair for creating and sustaining suspense… Um- okay. Claire Malvern wakes up in the middle of the night and discovers that her husband, Keith, is missing. They live in Washington State, where they are renovating an old fishing lodge they intend to open as a B and B. When Keith’s body turns up in the river, presumably after having jumped off the bridge at Bloodroot Falls, the Sheriff calls it suicide, but Claire just knows Keith would never kill himself. Sadly, though, Claire knows less about her husband than she thinks she does. And it turns out that most of the small cast of characters in Harper’s cliched novel have something to hide. Sadly, none of it is very interesting. Look- there are all sorts of this kind of book out there and I’ve read lots of them. What’s the most important ingredient to make them work? You have to care about the characters. They have to be believable. Nothing to look at here, folks. Move along and save your money. This entry was posted in Uncategorized and tagged 2008, Book Review, mystery, popular fiction, really bad books by Christie. Bookmark the permalink.